On special occasions, we want great food and we want fun. For chef Attila Bollok at Barton G. Los Angeles, every day is a celebration because all the dishes are visually extravagant or slyly clever. In his kitchen at Barton G., Bollok showed me how to prepare his signature dish, Lobster Pop-Tarts. The perfect dish for special events and entertaining. In the busy kitchen, Bollok is a chef who keeps his cool even when he and his staff are preparing food for as many as 400 dinners. Moving quickly around the small space, he always refers to his colleagues as "chef" and always says "please." That temperament might have come from his Hungarian grandmother who taught him how to cook when he was a young boy. But his good-natured cool also comes from the confidence born of solid training with culinary greats. As a teenager he did an apprenticeship at La Caravelle. He learned fundamentals at the French Culinary Institute (renamed the International Culinary Center). He worked side by side with David Burke at Fishtail and Comme Ça and Scott Conant at Scarpetta. When Barton G. Weiss, the creator of the original Barton G. in Miami's South Beach, was looking for a classically trained French chef who could help him launch a restaurant in Los Angeles, Bollok was ready for the challenge. When Bollok walks into his kitchen at Barton G. Los Angeles, he puts on his apron and a party hat. In his kitchen there are the usual stock pots, knives, cutting boards and utensils. Look above the stainless steel counters and you will see brightly painted metal pelicans and green mini-Tiki statues staring back at you. Next to his chef's knives and ladles there are rows of giant forks, swords and candy-colored Duralit toasters. Out in the dining room, complimentary bread arrives at the table looking like DayGlo doughnuts. The Diamonds Are Forever cocktail comes with a liquid nitrogen vodka popsicle stirrer. The Rakes and Ho salad is plated in a mini-wheelbarrow. The Great American Steak arrives with a 2-foot-tall fork stabbed into its properly charred flesh. If you like sweets and you order the Marie Antoinette's Head -- Let Them Eat Cake, a mannequin's head arrives with a 2-foot-high cotton candy hairdo on a plate of mini-cakes and ice creams. 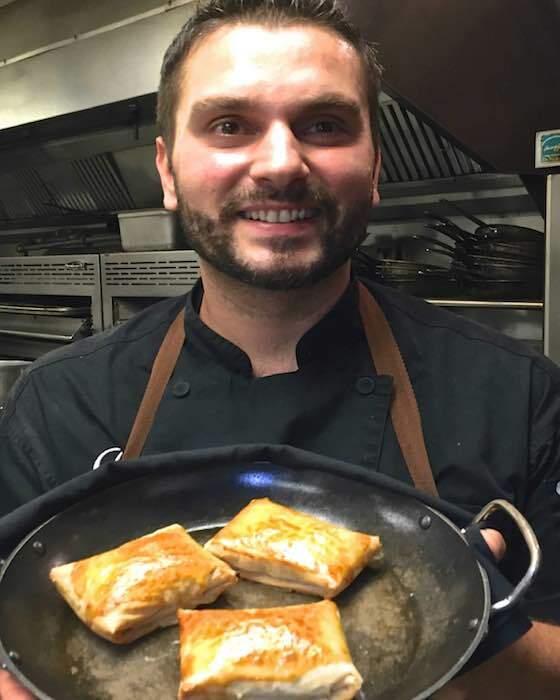 Yet even when creating food with a theatrical flair, Bollok is a serious chef who talks passionately about locally sourced ingredients and keeping food interesting with a play of textures and balanced flavors. Bollok enjoys the way his dishes balance whimsy with quality ingredients. His lobster Pop-Tarts look like plump versions of the jam-filled toaster Pop-Tarts kids eat for breakfast. 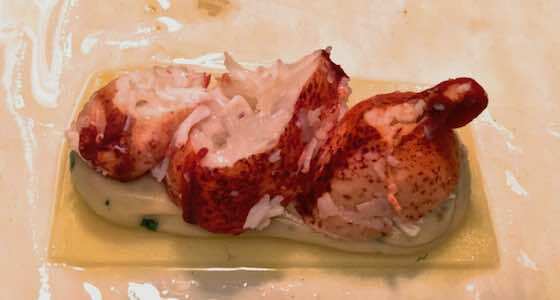 But cut them open and out tumble moist lobster pieces coated with luxurious herb-scented béchamel, an adult treat, for certain, and a lot of fun. In the kitchen at Barton G. Los Angeles, lobster meat on béchamel sauce and Gruyere cheese on phyllo sheets moistened with clarified butter make lobster Pop-Tarts. Written out, there are a lot of steps, but in the video below Bollok shows how easy it is to prepare his lobster Pop-Tarts. Cooked and frozen lobster meat can be purchased from fish markets and in some upscale grocery stores. For best results, Bollok suggests the extra effort of cooking a live lobster and extracting the meat. That way you will also have shells to make quality lobster stock. Making lobster stock is not difficult. Once you have steamed the lobsters by submerging their heads in boiling water and cooking them for 15-30 minutes depending on their size, extract the meat and reserve. Place all the shells in a pot with carrots, garlic, celery and onions. Add water to cover and simmer the shells with the aromatics for 30 minutes. Strain and discard all solids. Reserve stock to use immediately or freeze in an airtight container for later use. So you can work assembly-line-style, place all the ingredients on a counter or large cutting board. The delicate phyllo sheets can dry out, so once they are removed from the package, cover them with a damp kitchen towel. 1. Make roux by heating butter, being careful not to brown, and adding the flour. To avoid clumping, sprinkle flour in small amounts into hot butter. To make a "roux blanc," whisk flour into butter to incorporate, being careful not to brown. Once flour is incorporated and there are no lumps, whisk in milk. 2. Add stock. For 5 minutes, stir well and simmer to thicken. Use a heat-proof spatula to remove any sauce sticking to the side of the pot. Wisk together with sauce. When finished, the béchamel should be smooth, without lumps. 3. Sprinkle in Parmesan cheese and whisk over heat to incorporate. 4. To cool the béchamel, place ice cubes into a small stainless steel mixing bowl, then spatula the hot sauce into a second small mixing bowl. Place the second bowl on top of the ice cubes. Use a spatula to fold the sauce into itself to cool evenly. 5. To keep herbs green and fresh tasting, once the béchamel has cooled, sprinkle on the chives and tarragon and incorporate. Taste and season with salt and freshly ground pepper. Spoon béchamel into a pastry bag, seal, refrigerate and reserve. 6. Place butter into small saucepan over low heat. After the butter melts, skim the solids off the top and discard. Reserve clarified butter at room temperature. 7. Before assembling, heat oven to 375 F.
8. Place all Pop-Tart ingredients on a counter or large cutting board to create what chefs call mise en place. That way, you will be able to create the Pop-Tarts quickly so the phyllo sheets will not dry out. 9. Place the phyllo sheets on the counter. Cover them with a damp towel so they do not dry out. On the video, Bollock demonstrates all these easy steps. 10. You will need a total of six large phyllo sheets for each set of three Pop-Tarts. Work with two phyllo sheets at a time. Lay the two sheets on a flat surface. Paint the top sheet with melted clarified butter. Make sure the entire sheet is painted with butter, even the edges. Lay the next two sheets on top of the first two. Paint with melted butter. Lay the next two sheets on top and paint those. 11. Using a sharp chef's knife, cut the six stacked sheets into three sections. A ruler might be helpful so the Pop-Tarts will be the same size. 12. Work assembly-line-style to build three Pop-Tarts at the same time. Lay a piece of Gruyere in the middle of the top phyllo sheet. 13. Pipe 1 to 2 ounces of béchamel on top of each piece of Gruyere. Use more or less béchamel, depending on how moist you want your Pop-Tarts. 14. Add pieces of lobster meat on top of the béchamel. Line the pieces straight so when you fold over the phyllo sheets, the packet will have a perfect rectangular shape. 15. Fold the phyllo sheets the long way on each side of the lobster. The overlapping sheets should cover the lobster. 16. On each end of the folded packet, trim off 1 inch of the phyllo. Seal the long seam of the phyllo packet by brushing on melted clarified butter. 17. To create a rectangular Pop-Tart shape, lay a chef's knife against the end of the lobster filling. Bend the end of the phyllo packet against the knife and press down on the packet to create a clean fold. Do the same on the other end. The result will be a fat rectangular, Pop-Tart shape. Where the two ends are folded together, press gently so they seal. 18. Turn each Pop-Tart folded side down. Brush the top of each Pop-Tart with beaten egg yolk to create a golden crust. 19. 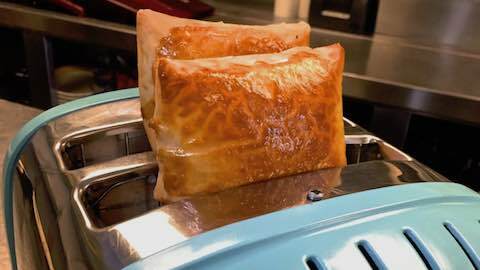 Gently lay lobster Pop-Tarts on a baking tray painted with clarified butter or on a sheet of parchment paper or a nonstick Silpat sheet. Place in preheated 375 F oven 10 to 12 minutes. Do not turn over. Check after 8 minutes to make certain they are not burning. Once the Pop-Tarts are golden brown, they are done. 20. Serve hot from the oven. "Pop-Tarts Get Adult Treatment With Lobster"